Trendy Euro style is yours with the Remonte Dorndorf by Rieker D6351 platform. 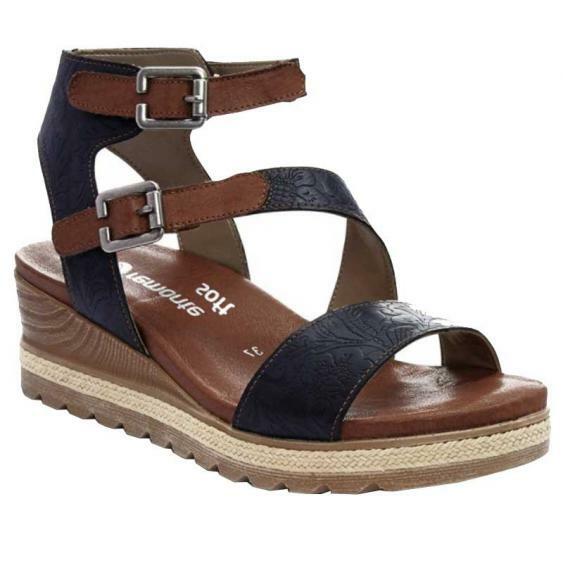 This women's wedge boasts a durable synthetic and leather upper with textured detail. Dual adjustable straps ensure on/off ease and a perfect fit. You'll find superior comfort in the super soft Remonte insole. A PU outsole provides traction and absorbs shock with each step. Get classic styling with modern details in the Remonte Dorndorf by Rieker D6351 wedge sandal. A high quality leather footwear manufacturer with a reputation for meeting a woman's demand for style and comfort.